Haven has expanded its material handling and systems control knowledge into the oil and gas pipe testing market. Haven designed a Gantry and rail system that supports a full body phased array ultrasonic tester. A walking beam transfer device positions the pipe in the test station, while simultaneously removing a tested pipe. In the test station, the pipe is rotated at a controlled rpm to match the specified linear speed of the ultrasonic tester carriage. 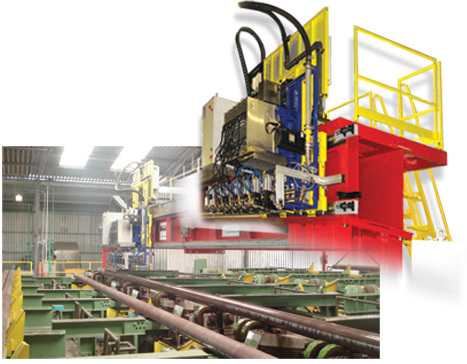 Multiple servo drives control the test cycle synchronization, while manipulation of up to 24,000 pounds of pipe at one time requires both precision and robust construction. The capacity of this system is from 2.50″ to 20.00″ diameter and up to 48 feet long. Prior to testing, each pipe is measured for length. Haven Manufacturing can design and build a wide variety of material handling systems for the tube, pipe and bar markets. Haven will work with you to develop the correct solution for your specific application. Turnkey integrated processing line for automotive industry.